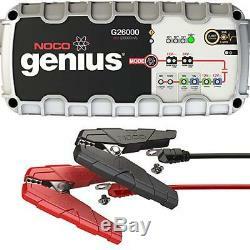 NOCO G26000 UltraSafe Smart Battery Charger. Perfect for Lead-acid, AGM, Gel & Lithium batteries. Charge fully drained lead-acid and lithium-ion batteries up to 500 amp-hour with zero overcharge - Stay safely connected 24/7. Charge 12-volt and 24-volt batteries, recover damaged batteries and works with CANBUS electrical systems. Ultra-compact, portable, energy-efficient design, UV and water-resistant (IP65). Actively monitors battery for safe and efficient charging. 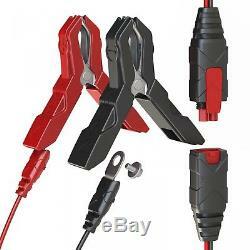 Includes spark-proof technology and reverse polarity protection. Advanced diagnostics automatically tests and detects a bad, damaged or shorted battery. Battery voltage: 12 Volt / 24 Volt. Good for: Acid Battery, Gel, AGM, EFB, Li-Ion and maintenance-free batteries. IP protection: IP65 (UV and water resistant). Dimensions LxWxH: 307 x 145 x 81 mm. The item "NOCO Genius G26000 12V 24V 26A UltraSafe Pro-Series Battery Charger" is in sale since Thursday, August 23, 2018. This item is in the category "Vehicle Parts & Accessories\Garage Equipment & Tools\Battery Testers & Chargers\Chargers & Jump Starters". The seller is "electroquest123" and is located in Conwy. This item can be shipped to all countries in Europe.